Currently, my dad is renting one of my upstairs efficiencies – which is wonderful! It is so good to have beloved family under the roof. The other efficiency has a wonderful new tenant, and because of this the chicken coop has three new hens! The downstairs 2 bedroom is about to turn over. The incoming tenant there is also lovely, and will be house hunting which allows me to hurry up and finish cosmetic upgrades to the main floor two bedroom. That will allow my son and I to rent it out and move downstairs (where the guts of the building are – water shut-off, heater, pumps, etc – really should be the landlord’s unit!). -2 really ugly and in poor repair bathrooms remodeled with Habitat for Humanity ReStore tile, new non-leaky faucets, ReStore paint, and lots of upgrading and reuse of current or ReStore fixtures and trim etc. -more insulation in attic and some air sealing – more needed, but correctly air sealed around boiler chimney. -one dishwasher replaced with energy star model. The only other dishwasher in the building has conked out and currently not been replaced. -2 out of four fridges replaced with energy star models. One tested and already fairly efficient. One left to go! Utility use depends a lot on tenant numbers, habits, etc, but generally gas use is down about 40% from the beginning, electricity around 50%, water a bit trickier to tell – very dependent on number of tenants and bathing, garden watering and other habits. I have recently discovered I still have some very low hanging fruit in the efficiency department – part of the north side of my salt-box roof has no insulation (just kraft paper and foil – guess it’s supposed to be a radiant barrier – those wacky 1960’s builders!) and I still haven’t managed to seal a massive cold air leak at the basement rim joist where the porch attaches (even though I sprayfoamed well where I thought it was). So some air sealing and insulating that should have a great payback. Other big projects I dream of involve insulating the back shed (which recently got a south facing window), finally adding bike parking and a small greenhouse, and taking out the small, single pane northfacing windows in the basement apartment and earth-berming that north side of the above-ground basement wall. 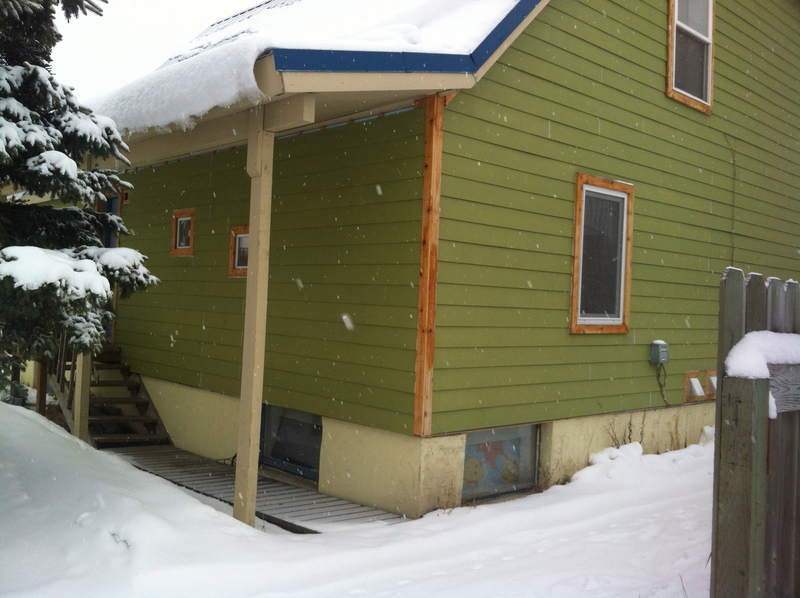 This entry was posted in green landlords, green remodeling, transition to eco-plex. Bookmark the permalink.